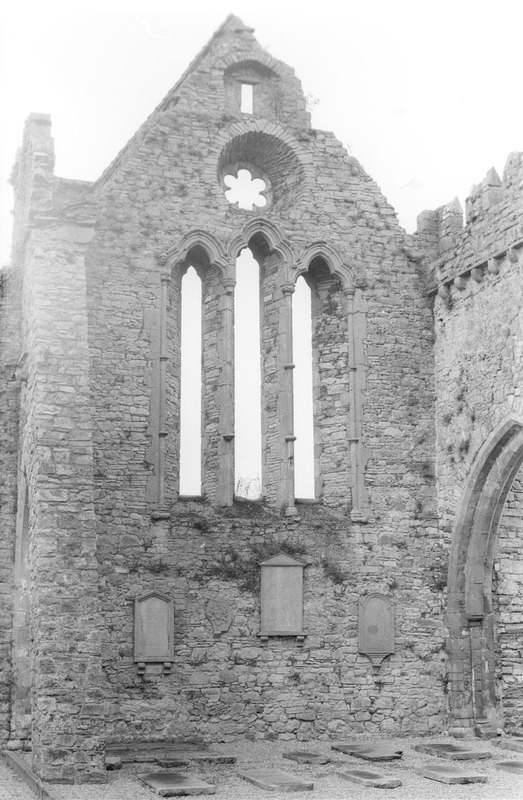 “St Mary's Collegiate Church, Gowran, Co Kilkenny, interior - nave, west gable,” Gothic Past, accessed April 19, 2019, http://gothicpast.com/items/show/1270. Photograph by Roger Stalley. West gable of nave showing triple lancet windows with rectangular and sexfoil rose window overhead. North elevation shows part of one nave bay showing quatrefoil pier with chamfered arches and corbel table and battlemented top. Lancets have roll - and - fillet arch and hood mouldings; capitals are of stiff - leaf foliage and bell design on shafts with annulets; label stops are carved with male heads.